With just under 30,000 residents (and growing) Eagle, Idaho is a highly desirable town nestled between the Boise River and the Foothills. With its upscale country setting, this friendly, family-oriented community offers a rich assortment of amenities to residents, visitors and local businesses alike. Located just 5 minutes from Meridian and 25 minutes from downtown Boise, residents enjoy all of the comforts that come with a small-town atmosphere; yet relish the perks of being close to a hopping metropolis. Often, when we introduce clients to the Eagle area, they rave about the city’s charming and welcoming vibe. Self-contained, yet centrally located, Eagle appeals to a large variety of newcomers and native Idahoans alike. Full of historic charm, Eagle’s old town district offers an eclectic mix of shops, galleries, restaurants and cafes. And with the Boise River spanning the full length of town and the gorgeous foothills rising from the north, the city truly is quite breathtaking. As far as residential life goes; Eagle homes range from gated riverfront communities - to smaller townhomes - to single-level ranch homes - to mansions with acreage - to waterfront estates - and everything in between. If you’re curious to view homes currently on the market in the Eagle area, click here. Or to learn more about Eagle’s current market, demographics, growth, schools (and more) keep reading. 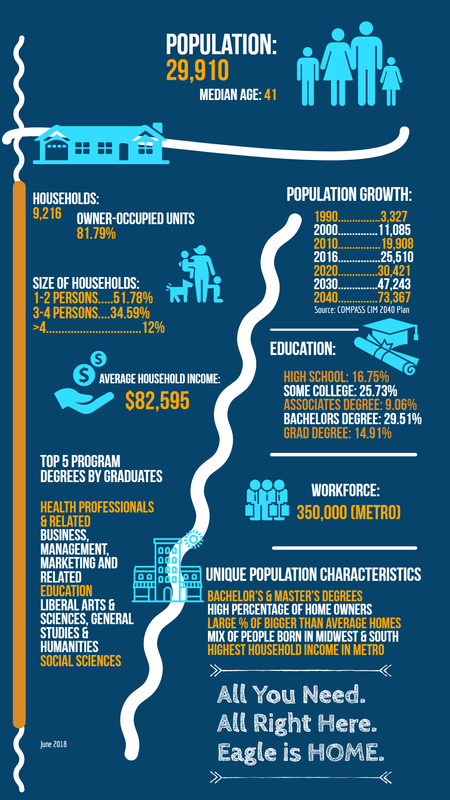 Since 2000, Eagle has grown by over 70% and has been deemed as being one of the Top 2 Most Successful Cities in Idaho. The schools in Eagle rank quite high academically with test scores exceeding the national average. Check out Great Schools to learn more about the various public, charter and private schools Eagle offers. Eagle is known for their annual Eagle Fun Days celebration along with various winter and summer events at Eagle Island State Park. Its relatively mild climate allows residents to take advantage of outdoor activities year-round. Whether you prefer fly fishing, biking, golfing, strolling on the Greenbelt, wine tasting, whitewater kayaking or mountain biking (or something in between) - Eagle offers its residents with seemingly endless options. For a comprehensive list of current events, check out The City of Eagle’s comprehensive calendar (here). If you currently own a home in Eagle, this is an ideal time to sell. Click here to receive a free home value evaluation. Or perhaps you are ready and looking to find YOUR perfect Eagle home? Click here to start your Eagle, Idaho home search.